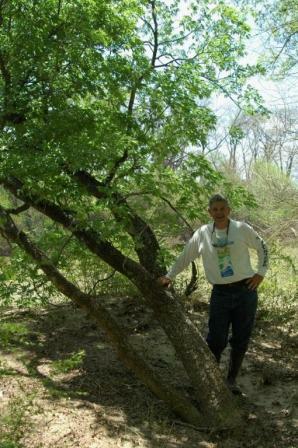 NATUAL HABITAT AND PREFERRED SITE: Texas buckeye likes the hard granite sands of the Edward’s Plateau although it will also grow in deep soils from sand to heavy clays. It can grow from sun to part shade but the best location is morning sun with afternoon shade. 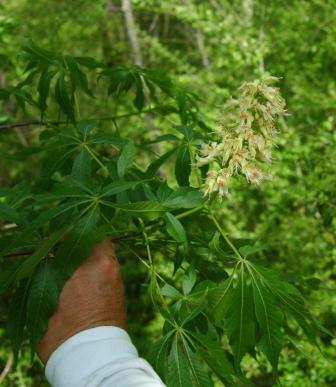 IDENTIFICATION INFORMATION: Texas buckeye has an upright form with large compound leaves which almost completely defoliate in mid summer because of the heat and so called fungal diseases. FLOWERS AND FRUIT: The flowers are off white to light yellow in terminal clusters appearing after the leaves unfurl. The round hairy or warted fruit appears in early summer. It often looks like a leathery capsule with blunt spines and 1 to 3 large shiny seeds. BARK: The bark is gray to black with narrow fissures. 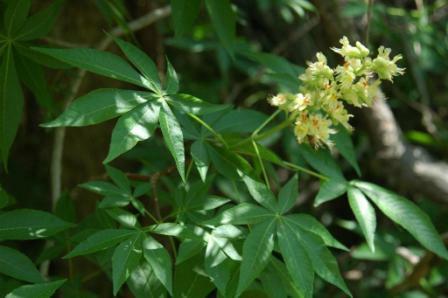 FOLIAGE: Large compound leaves with 7 to 9 leaflets, occasionally as many as 11. Fall color is yellow often turning in mid summer when the heat and/or fungal diseases defoliates the plant. CULTURE: Texas buckeye is easy to grow and should be used more often. It grows well in moderately prepared garden soil or in most native soils throughout Texas other than in areas of high rainfall. PROBLEMS: Summer foliage defoliation. Regular waterings during the heat and dry part of the summer will normally help to prevent the defoliation. PROPAGATION: Buckeyes germinate easily from seed from fresh untreated seed. Roots will sometimes emerge from seed while in storage. No need for any pretreatment of seed. Plant immediately after collection. Seed will germinate anywhere from 3 days to 30 days. The first season or two will be spent developing root systems. Buckeyes can also be grown from root cuttings, taken in late winter just before new growth emerges. This is also a time to try stem cuttings, kept in moist potting soil and a humid environment. INSIGHT: Most publications say that all parts of the plant are probably poisonous but livestock will only graze on the young buds and foliage generally ignoring the older growth. 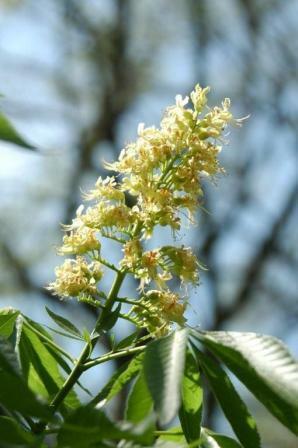 Ohio Buckeye, Aceulus glabra var. glabra, is said to be not well- adapted for Texas but there is a beautiful specimen growing in the Fort Worth Botanical Garden as you can see from this photo. It can be identified by having fewer leaflets – usually five. There are also some growing in east Texas. Texas Buckeyes in bloom in the Trinity River bottom.